The Man In Black to perform at 2019 Fair! 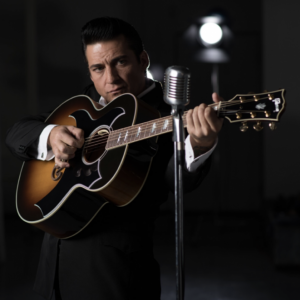 Home › Latest News › The Man In Black to perform at 2019 Fair! (PASO ROBLES, CA) – The California Mid-State Fair is pleased to announce that “The Man In Black” will be performing at the 2019 Fair on Friday, July 19, with performances at 6:30 pm and 8:30 pm. The concerts will take place on the Frontier Stage and will be free with paid Fair admission. Barker’s path to his current success wasn’t a straight line from gospel choir. After serving his country in the Army, Barker came home to Missouri, took a job as a carpenter, and spent all of his free time learning to play the guitar. He developed strength and versatility in his voice by modeling his crooning on a cast of American legends- Johnny Cash, Elvis Presley, Roy Orbison, Buddy Holly, and Gene Vincent. His performances quickly turned from hobby to profession, but oddly enough, Barker’s first touring gigs were portraying Elvis, not Johnny Cash. Everything changed, however, when Barker was asked to audition for the part of Cash in a Hollywood production, as it became evident to the director and Barker himself that Johnny Cash was his true calling. From that point on, there was no turning back.